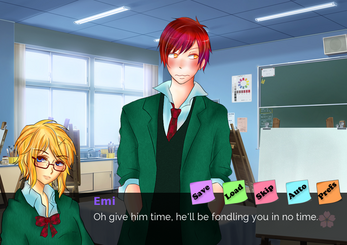 Emi is a serious, no nonsense art student who plunges herself into her work with everything she has. Stoic, closed off and guarded, she veers away from people as much as possible. The only thing that bothers her is how people say her artwork often "has no soul" to it" and are "beautiful, but not moving." 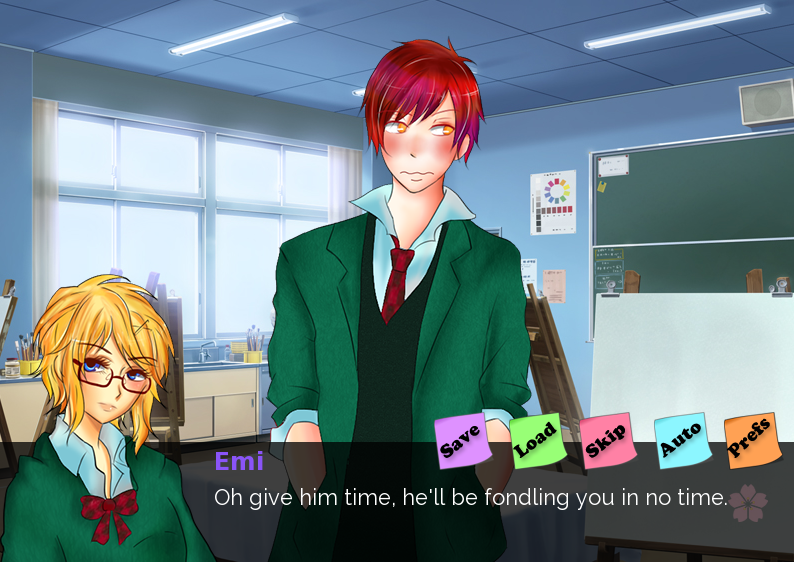 Very soon, she crosses paths with Kou, a cheerful and outgoing boy who says he has to "join the art club NO MATTER WHAT". His desperation sickens her, as he seems one of those aloof geniuses and she doesn't want her hard work to be outdone by someone so mindless. But as time passes and they interact will things get better? Will the mere presence of him not cause her to roll her eyes or scoff anymore? Will she be able to quell her first instinct, which is to punch him in the gut every time he flashes that cocky grin? Will she be able to infuse 'soul' in her artwork? And why does he have such strangely coloured eyes? Sprites, Writing, Coding, the weird CGs, Everything else: Yours truly. 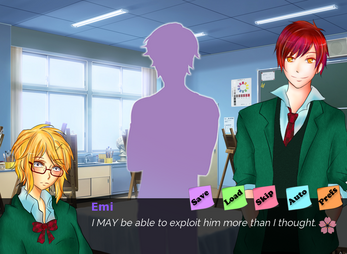 Contains about 11,000k words with one main path, one game over, six CGs and four achievements. I've already said so at Lemmasoft, but I shall repeat myself that I absolutely LOVED this game. I won't lie, Emi is probably one of my favourite heroines now. Like seriously, we NEED more visual novel leads like her... I just loved her so much like you won't believe, and Kou was the perfect contrast to her cynicism and sarcasm. It was so well written and really funny! But also gave me feels. You know, I think the best part of this game was how relatable Emi's situation was, whether is was self-forced or brought on by someone else. I liked how even though there were fun parts during the arcade "date," there was still a sense of foreboding of what was going to happen after. Kudos to the scriptwriter for that. Very nice. Overall, this was an enjoyable game to play!